Asparagus is an investment in time that will pay you back in bountful crops within 3 years. They are easy to grow, but you do need to do some preparation before you plant them. Asparagus crowns can be planted from mid March to April and you can expect to get 25 years of cropping from each crown (all our asparagus crowns come in sets of 5). This bit always sounds more complicated than it is. So let us break it down and make it easy. Your asparagus crowns will need to be planted in a sunny spot in a completely weed-free bed. Dig it over well, pulling out any weeds as you go along. The trenches should run down the entire length of the bed measuring 30cm wide and 20cm deep. Fill the bottom of each trench with a 10cm layer of compost or well rotted manure. Use some of the soil that you dug up from the trenches to form a ridge running lengthways down the centre of each trench. This ridge should be 10cm high. Place each asparagus crown 45cm apart along the top of the ridge. Gently arrange the roots of each asparagus crown so that they are spread out evenly and trail down the sides of the ridge. Use the excavated soil to cover up the asparagus leaving just the very tips visible. TOP TIP: Do stages 1 to 4 before your plants arrive so that you’re ready as your asparagus crowns will want to be planted asap on arrival! Every spring, in March, give them a liquid feed. During spring and summer, keep them watered and thoroughly weeded. TOP TIP: Weed by hand, not with a hoe, as this will prevent you from damaging the plants. In late autumn, cut off any yellowing foliage and add a nice mulch around the base of the plants. Year 1 – Not yet!! Patience is a virtue. Your asparagus will be much better off if you leave it another year or two to grow strong and healthy. Year 2 – If you must. You can harvest a few spears, but it’ll be better if you can bear to wait one more year. Year 3 and onwards – YES! 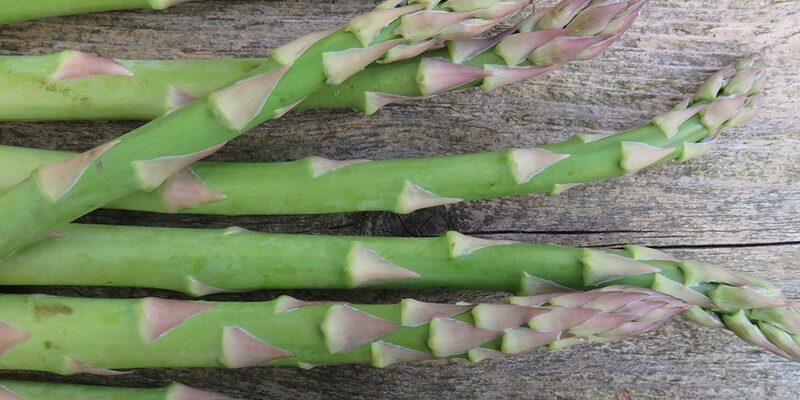 In April/May you can merrily harvest your asparagus spears by cutting off at the base. It’s best to stop harvesting by the end of May so that you get a good crop the following year as well.